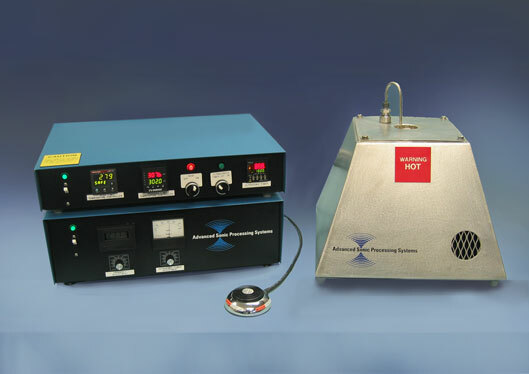 The Ultrasonic Solder Pot is a self contained soldering system. 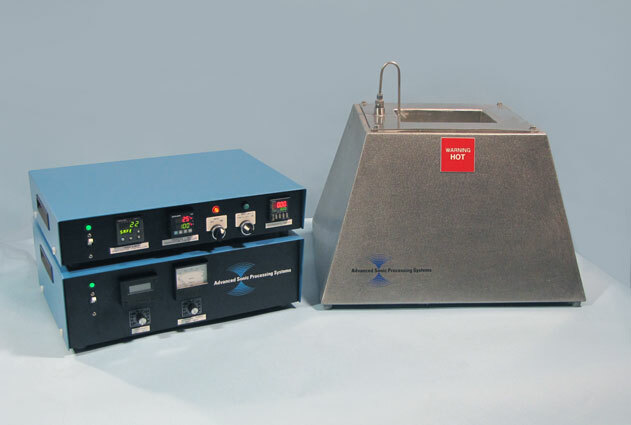 The high-powered ultrasonic tank provides rapid removal of surface oxides located on the immersed component. Intense cavitation implosions etch through surface oxides exposing a layer of clean base material. The soldering alloy rapidly wets the clean surface providing a uniform bond with superior performance. tooth and increased bond strengths. Micro-etching action is accomplished in seconds. uniform bond with superior performance. Uniform wetting without the use of a soldering flux. Ultrasonic Soldering maximizes the effectiveness of many joint designs. 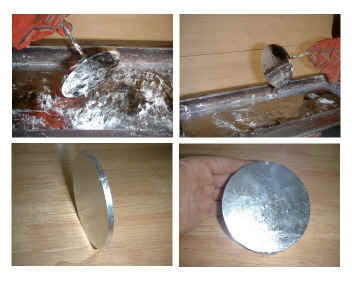 Sometimes flux is necessary due to the base materials chosen. Ultrasonic Soldering allows for a reduction in the chemical strength of the required flux while improving overall performance. Wide range of melt temperatures available. Wide range of soldering alloys available. The USP-2 is ideal for soldering delicate components. the burn hazard while allowing immersion access. demanding installations. This 2.6l tank has a 9" x 6" opening. The USP-3605R is a round bottom soldering vessel. 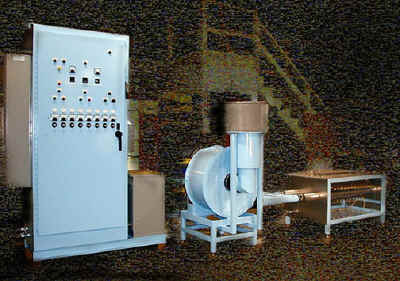 concentration of ultrasonic energy accelerates oxide removal. bond between the base material and the soldering alloy. The USP-3605R shown with the enclosure. electrical coils may be easily replaced if ever overheated. Our Transducer Assembly is permanently attached. The transducer is silver-brazed to the transmission stub and the stub is fully welded to the Soldering Pot's tank bottom. This solid one-piece construction offers the highest acoustical efficiency available. The transfer of power from the transducer to the soldering alloy is maximized and permanent. Our confidence in this system is backed by our 10 Year Transducer Warranty. The High-Limit Temperature Controller monitors a dedicated immersed thermocouple on larger systems. The High-Limit Temperature system is completely independent of the primary heat control system. We offer a variety of methods to acoustically activate molten metals. Another popular method is to immerse a Power Probe's Wear-Tip directly into the molten material. The ultrasonic energy will remove dissolved gases and enhance grain structure refinement. The Permendur Power Probe offers the ability to acoustically activate molten metals in continuous or batch casting operations. The USP open top design allows the operator to insert the component directly into the acoustically energized soldering alloy. The molten alloy couples the acoustic energy to the immersed object. Within seconds, the component is uniformly wetted and ready to be withdrawn. 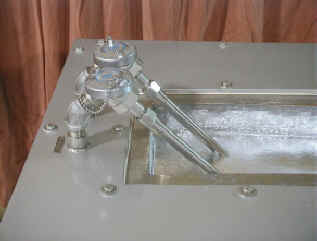 Transducer Cooling Blower with interlocking controls. Large Surface Area Heaters for efficient operation. 1" Thick Ceramic Insulation with stainless steel insulation covers. Working Temperature: to 500°C (dependent upon model number). Wetted Surfaces: 316L Stainless Steel. Variable Ultrasonic Power (0% to 100%). Frequency Adjustment with Digital Display. Automatic Ultrasonic Timer activation by footswitch or PLC. Electrical Rating: NEMA-1 or NEMA-12, IP23 or IP52. Concise Proportional Temperature Controller with Digital Display. High-limit Temperature Controller with Digital Display. Primary Temperature Controller has an immersed thermocouple. 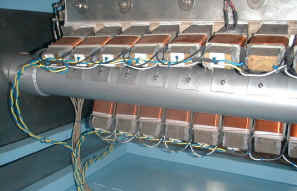 Ultrasonic Generator(s) mounted in a separate electrical enclosure. Soldering Pot Heat Control System.